Sept. 28, 2010 -- On Thursday, Dec. 15, 1927, shortly after noon, a well-dressed young man with dark, wavy hair rushed into the Mount Vernon Junior High School on 17th Street in Los Angeles. 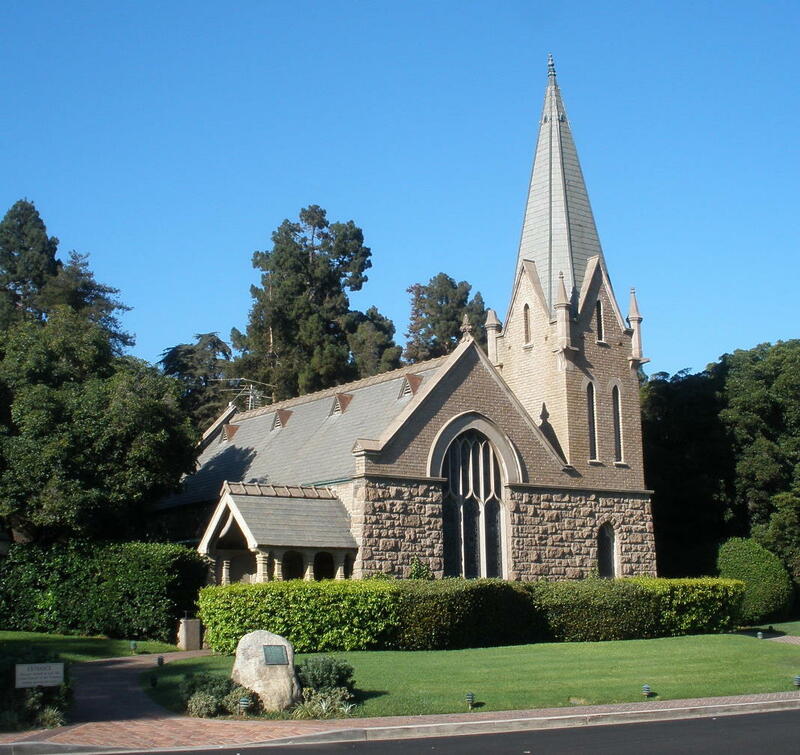 The man went into the school office, found registrar Mary Holt, and told her that he worked at the Los Angeles First National Trust and Savings Bank and that his boss, Perry M. Parker, had been seriously injured in an automobile accident. The man said Parker was asking for his daughter, who was a student at the school, and he has been sent to retrieve her. Holt said she was a little suspicious about the man because he asked for Parker's "younger daughter." 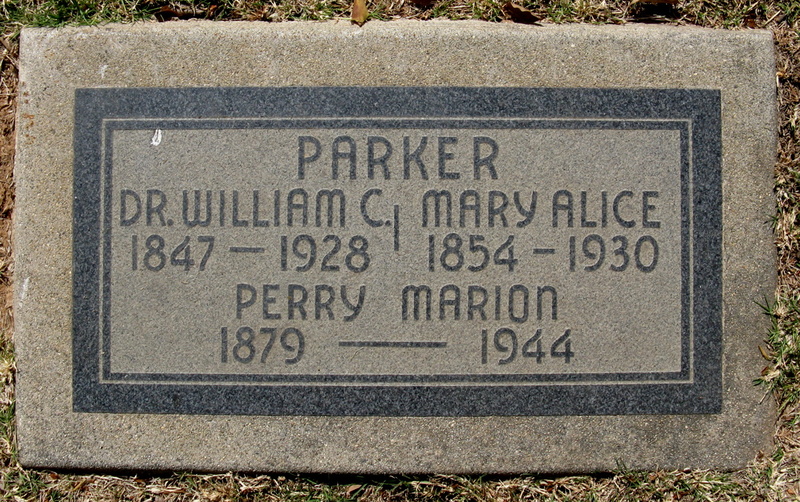 Parker had two daughters, Marion and Marjorie, both students at the school, but they were 12-year-old twins. When questioned further, the man said he was sent to pick up the "smaller one." When Holt hesitated, the man said, "I am an employee of the bank where Mr. Parker is chief clerk, and if there is any doubt in your mind, here is the bank's telephone number. You may call there." Holt said the man's sincerity convinced her, and Perry Parker did work at the bank, so she sent for Marion, who was brought from a Christmas party being held in one of the school classrooms. When Marion arrived at the school office, the man reassuringly patted her arm, told her that her father had been in a car accident, and that he was going to take her to him. Marion, thinking her father was injured, eagerly went with the man, who escorted her out to his waiting car. As Marion and the man walked out to his car, Marjorie Parker saw them, and she later told police that she didn't recognize the man. The man who took Marion was described as a white man, 25 to 30 years old, 5-feet-8, with a slender build, thin features and dark brown, wavy hair. That evening, Perry Parker received a telegram at the family home at 1631 South Wilton Place, less than a mile from the school. 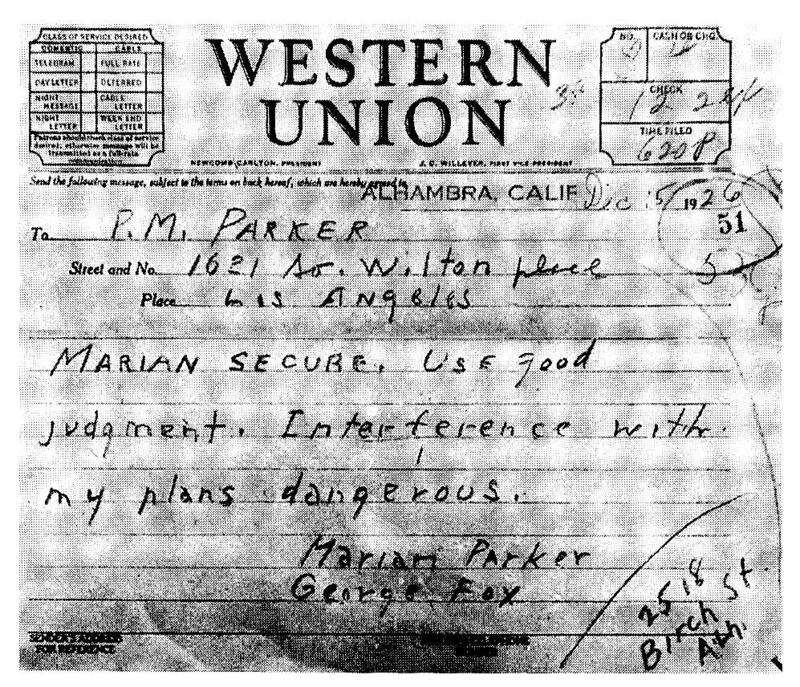 The telegram had been sent at 6:20 p.m. from the Western Union office in Alhambra, Calif., and told Parker that his daughter had been kidnapped, and to expect further telegrams with ransom demands. "Marian (sic) secure," the telegram read. "Use good judgement. Interference with my plans dangerous." Police suspected that the man was familiar with the Parker family, since he knew that Perry Parker worked at the bank. But Parker stayed home from work that day to celebrate his 48th birthday, with his wife, Geraldine. The next day, Parker received a special delivery letter, demanding $1,500 for his daughter's safe return. According to the letter, "Fulfilling these terms with the transfer of the currency will secure the return of the girl. Failure to comply with these requests means no one will ever see the girl again -- except the angels in heaven. The affair must end one way or another within three days -- seventy-two hours. You will receive further notice." 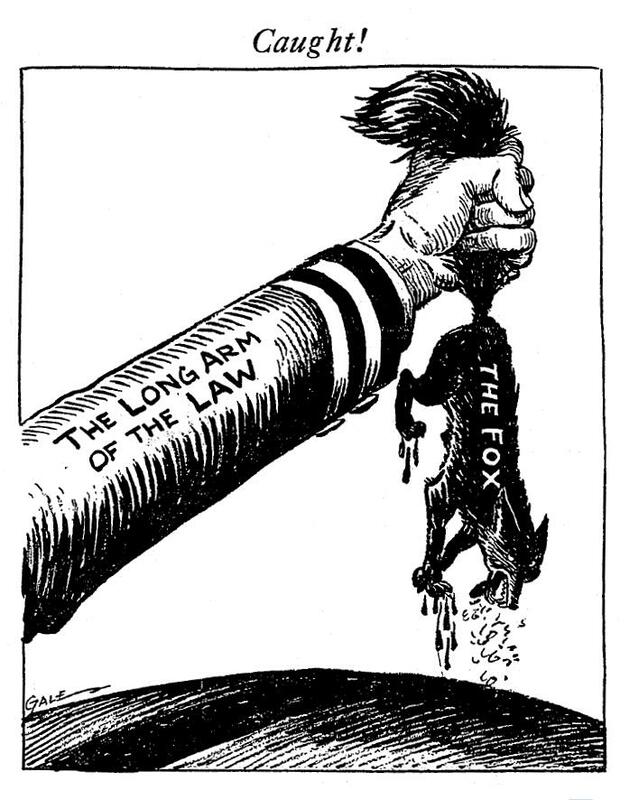 The letters and telegrams were first signed "George Fox," then simply "The Fox." As more than 2,000 police officers worked on the case throughout Southern California, police initially told Parker not to make the payment. But after Parker received additional telegrams and phone calls, with increasing threats to kill Marion if the kidnapper's demands weren't met, police decided that the best hope to get Marion home safely was to pay the ransom. The kidnapper called Parker and arranged a meeting for that evening at 10th Street and Gramercy Place, but the kidnapper noticed that police vehicles were following Parker's car, so he didn't keep the appointment. 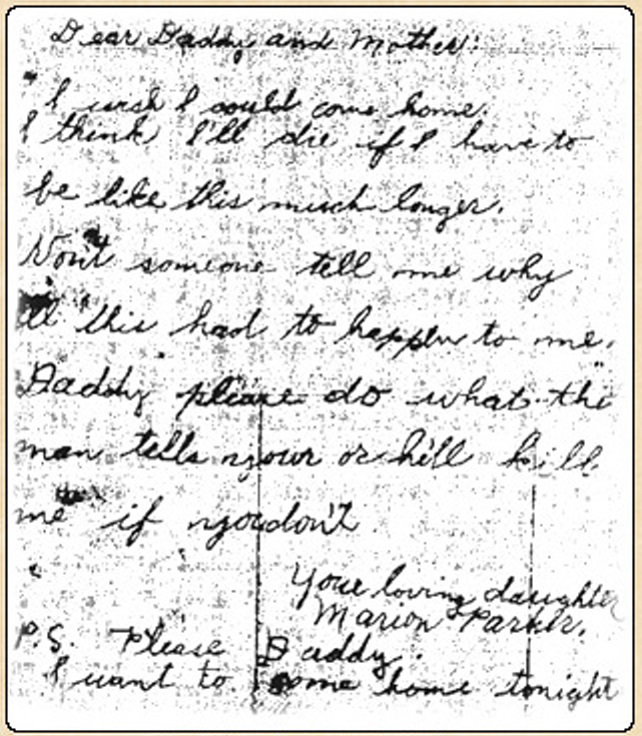 One of the special delivery letters to Parker included a letter written by Marion: "Dear Daddy and Mother, I wish I could come home. I think I'll die if I have to be like this much longer. Won't someone tell me why all this had to happen to me. Daddy please do what this man tells you or he'll kill me if you don't. Your loving daughter, Marion Parker. P.S. Please Daddy I want to come home tonight." 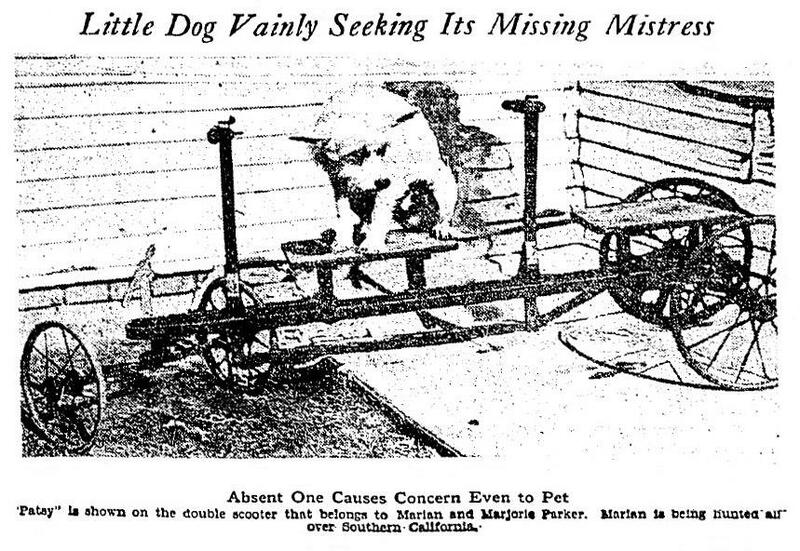 Newspapers in Los Angeles and across the country were filled with stories and photos about the search for the missing girl, and the family's vigil, including family photos of Geraldine Parker with Marion and Marjorie, and even photos of the family dog, Patsy, sitting on a double scooter belonging to Marion and Marjorie, "vainly seeking its missing mistress." On the morning of Saturday, Dec. 17, Parker received another telegram, again demanding $1,500, and saying that if Parker didn't come alone to the next meeting, Marion would be killed. That evening, at 7:35 p.m., Parker received a phone call from the kidnapper. He was told to immediately leave his home with the money, and drive to the corner of Fifth Street and Manhattan Place in Los Angeles. The kidnapper said he would pull up beside Parker's car, show him that Marion was safe, take the money, and would drop Marion off a block away. As instructed, Parker left his home with $1,500 in marked $20 bills, and this time he did not tell police about the rendezvous. Shortly after he arrived at the meeting spot, in front of 428 Manhattan Place, a Chrysler coupe pulled up beside Parker's car, with Marion sitting motionless in the front seat. The driver, with a white handkerchief over his face, pointed a sawed-off shotgun at Parker. "You know what I'm here for," the man told Parker. He then pointed at Marion in the front seat of the coupe. "Here's your child," he said. "She's asleep. Give me the money and follow instructions." Parker handed over the money and, as he had been instructed, followed the coupe to 432 South Manhattan Place, where the car door opened, and Marion was pushed out onto the lawn. Parker tried to get the license plate number of the car, but the kidnapper had bent the ends of the plate in, so Parker was only able to get a partial number. As soon as the coupe drove off, Parker jumped from his car and rushed to his daughter's side, took her in his arms, and realized that she was dead. When passers-by heard Parker's screams, they called police. Marion Parker had been horribly mutilated, and her body wrapped in towels. Both of her legs had been cut off close to the body, her arms had been cut off, and she had been disemboweled and her body stuffed with rags. A wire had been twisted tightly around her neck, cutting deeply into her skin, then went up the back of her neck and was wrapped tightly around her forehead, in an attempt to hold her head up. Her eyelids were sewn open with black thread to make it appear that she was still alive. A medical examination determined that Marion was killed just a few hours before her body was dumped out of the car. With the recovery of Marion's body, the case escalated from a kidnapping to a murder investigation, and all of Southern California seemed ready to join in the hunt for the killer. Police investigators worked on reports that the murderer might have fled south to Mexico, or north toward San Francisco. On Sunday, Dec. 18, police announced that they had recovered the Chrysler coupe driven by the kidnapper in a parking garage in the Westlake Park district, and six separate bundles containing missing parts of the slain girl's body were found, wrapped in newspaper and dumped along roadways in Elysian Park, near the current site of Dodger Stadium. The car was determined to have been stolen during a hold up in Kansas City, Mo., more than a month before Marion was abducted. About a block away from the spot where Marion's body was dumped, at 620 South Manhattan Place, a resident found a suitcase containing blood-soaked papers, and a spool of thread. Identical thread had been used to sew Marion's eyes open during the kidnapper's meeting with her father. Warner Brothers' radio station KFWB broadcast a call to raise money for a reward fund. The station had hoped to raise $1,000, but quickly received contributions of more than $20,000. Evangelist Aimee Semple McPherson broadcast a plea for her followers to contribute to the reward fund. Within a few days of the crime, the total reward reached $50,000 -- over $600,000 in 2010 dollars. Thousands of police officers from San Francisco to San Diego were actively working on the case, and thousands of calls were received from citizens hoping to provide useful information. An estimated 12,000 members from American Legion posts throughout Southern California, described as "the greatest group of ex-servicemen ever called out in a peacetime emergency," organized and offered their services to the police effort. The U.S. Secret Service also volunteered to help the L.A. Police Department in the search for the killer, and 100 Los Angeles firefighters assisted in the search of the areas in Elysian Park near where the bundles containing her body parts were found. California Lt. Gov. Buron Fitts sent a telegram to Gov. Clement C. Young, calling the murder of Marion Parker, "the most vicious and atrocious crime in California history," and asking that the state offer a substantial reward for the capture and conviction of the murderer. 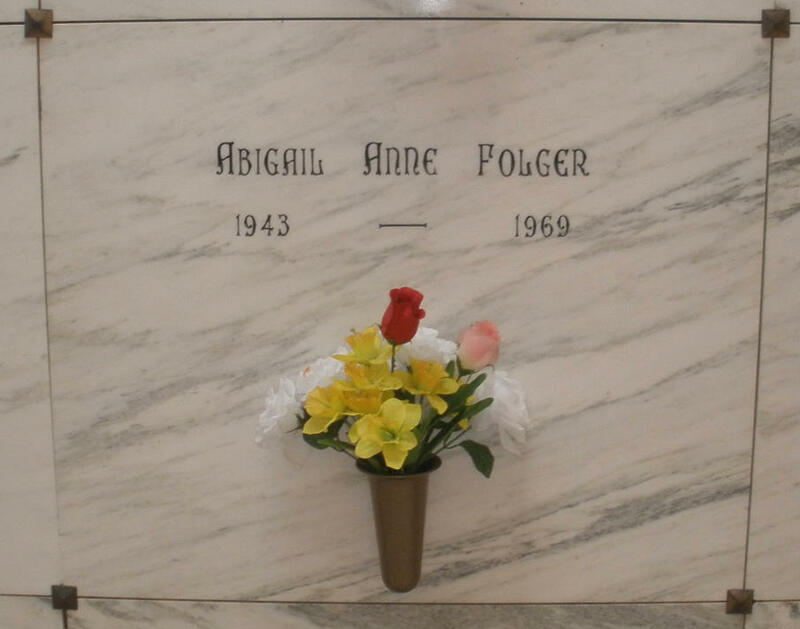 Meanwhile, private funeral services were held for Marion at the Little Church of the Flowers at Forest Lawn Memorial-Park in Glendale, Calif. Marion's body was cremated and quietly laid to rest inside Forest Lawn's Great Mausoleum, in the Columbarium of Peace on the Evergreen Terrace. The first major clue in the case came from one of the towels wrapped around Marion's body. A label on the towel identified it as coming from the Bellevue Arms Apartments, in an area of the city northwest of downtown known as Angelino Heights. The manager of the 88-unit apartment building, at 1170 Bellevue Ave., said a man fitting the description of the suspect had rented an apartment the preceding month -- Room 315, in the back of the building -- giving the name "Donald Evans." 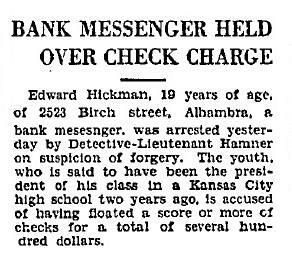 "Evans" was later determined to be William Edward Hickman, 19, who had been arrested in June 1927 for attempting to cash a forged check at a bank in Los Angeles, reportedly so that he could use the money to buy a motorcycle. Hickman had worked for six months as a messenger at the same bank where Parker worked, but he lost his job after pleading guilty to the forgery charges. After Hickman was convicted of the forgery charges and given probation, he returned to the bank and asked to get his messenger job back, but his request was denied -- by Perry Parker. Parker also said that, shortly after Hickman lost his job at the bank, he applied for a job with another company, and Parker was asked to supply a reference. He refused, and Hickman didn't get the job. 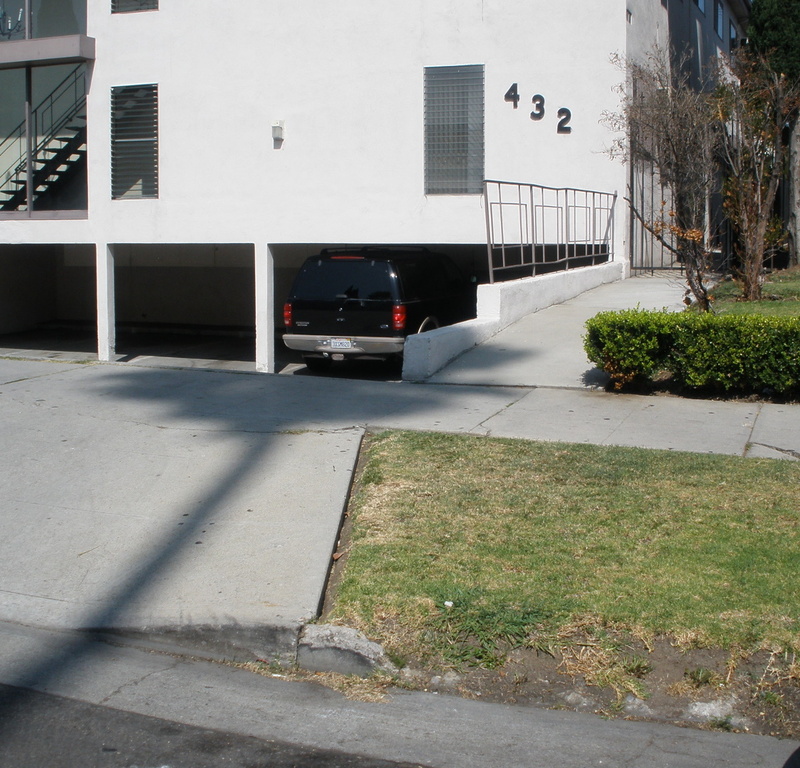 At the time of his forgery arrest, Hickman lived with his mother and sister on Birch Street in Alhambra, Calif. Shortly after his arrest, the family moved back to their hometown of Kansas City, Mo., and Hickman found a job as a theater usher. 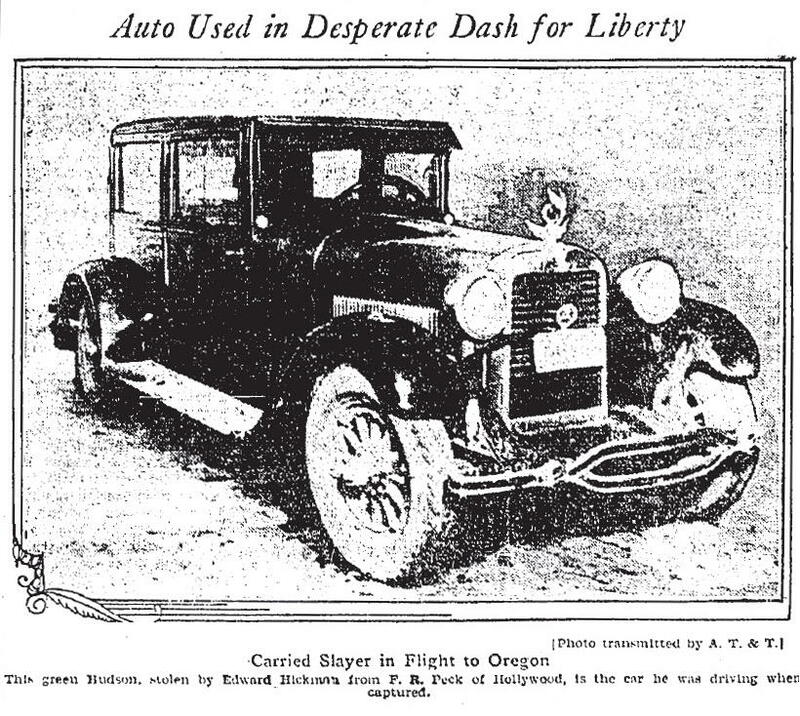 In early November 1927, Hickman stole a 1927 Chrysler coupe at gunpoint from Dr. Herbert Mantz in Kansas City, drove to Chicago, then drove back to Los Angeles. On Nov. 23, he rented the apartment at the Bellevue Arms, giving the name "Donald Evans," and requesting a quiet room in the back of the building. By the time police arrived to search the apartment, Hickman was gone. Fingerprints found at the scene matched prints found on the Chrysler coupe, and on the ransom telegrams. The prints also matched those taken from Hickman when he was arrested on the forgery charges. A key piece of evidence, police said, was a piece of a Brazil nut found in a trash can in Hickman's apartment. Police said the piece exactly fit with another piece found in the pocket of Marion's dress when her body was dumped out of the kidnapper's car. On Tuesday, Dec. 20, Hickman was formally charged with kidnapping and murder, and the massive search was on. Men all over the country who fit Hickman's description were arrested and questioned. Los Angeles police detectives on two planes flew to Las Vegas to arrest a possible suspect on a bus headed to Terre Haute, Ind. 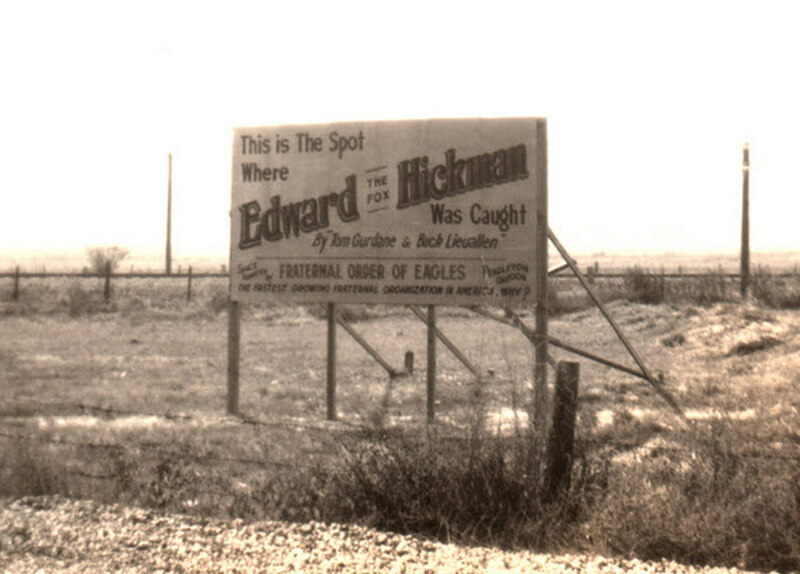 Hickman sightings were reported in Chicago; New York City; Tucson, Ariz.; Tulsa, Okla.; Wichita, Kans. ; and Des Moines, Iowa, and all along the West Coast. One man who lived a few miles from the scene of the abduction was arrested five times before police finally gave him a letter stating that he was not Hickman, and he shouldn't be arrested again. 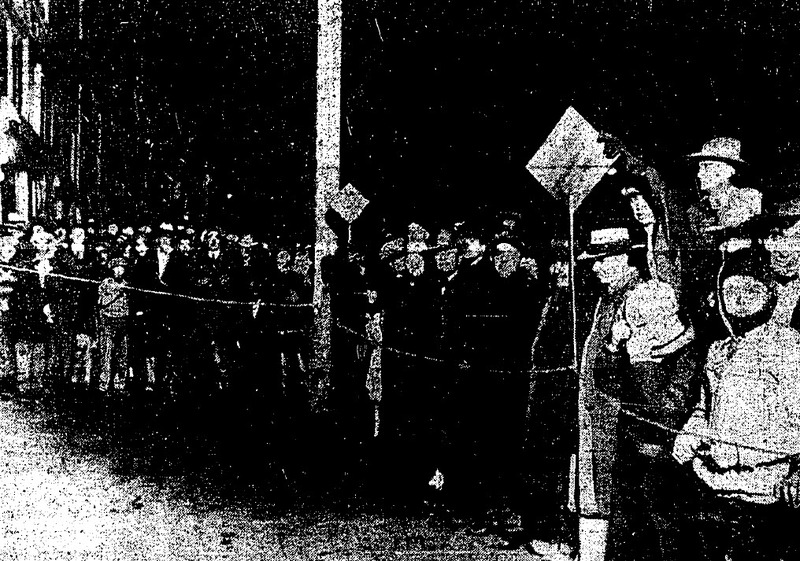 A man fitting Hickman's description was surrounded by an angry mob at Sixth and Hill streets in downtown Los Angeles. Police arrived just in time to rescue the man, questioned him, and released him. "This and many other occurances of similar type demonstrate the fever pitch into which the details of the horrible crime have thrown the citizens of Los Angeles," according to the Los Angeles Times. Hickman, however, was long gone. 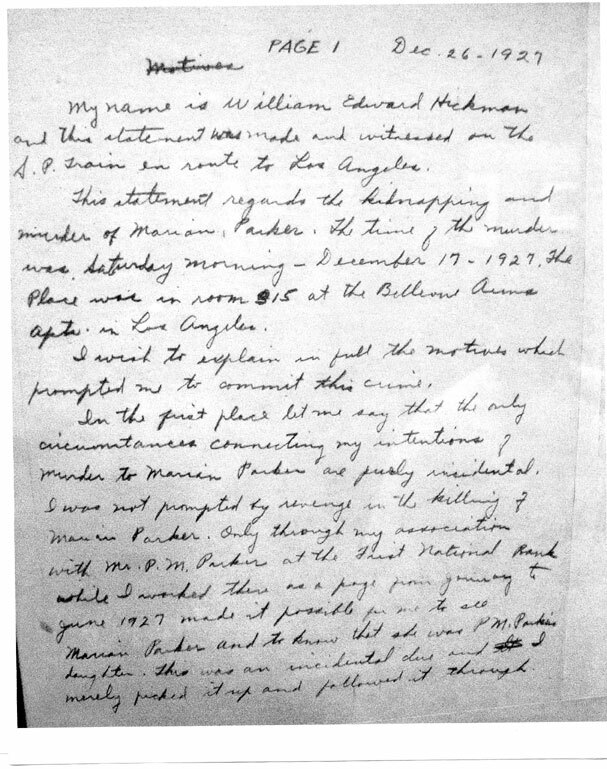 The day after his meeting with Parker, Hickman hijacked a 1928 green Hudson sedan on Hollywood Boulevard, stole $15 from the driver, and headed north to San Francisco where he spent one night in a hotel, then continued on into Oregon, then Washington. On Wednesday, Dec. 21, Hickman purchased a hat, gloves and underwear at a store in Seattle, and paid for his purchase with one of the $20 bills he had received from Parker. The clerk in the store recognized the serial number on the bill as one from the murder case, and called police, but Hickman had left before officers arrived. Another of the marked $20 bills was used to pay for gasoline at a garage in Kent, Wash. In his initial statements to police, Hickman admitted to being involved in Marion's kidnapping, but he said he didn't kill her. He told police he was working with two accomplices, and one of them -- Andrew Cramer -- killed the little girl. Hickman said he became involved in the kidnapping plot because he needed money for college. But Cramer, the man Hickman identified as Marion's killer, had a solid alibi -- he had been in jail in Los Angeles since four months before the kidnapping. While Hickman was being held in the City Jail in Pendleton, Ore., hundreds of people crowded into an alley next to the jail, hoping to get a glimpse of the famous prisoner. In response to their requests, Pendleton Police Chief Tom Gurdane, who was one of the two officers who arrested Hickman, brought Hickman to a door of the jail where the crowd could file past and get a look at him. According to the Associated Press, "gaudily blanketed Indians stared impassively at the youth, pretty women stopped to peer into the grated room, grim cowmen with their own ideas of justice stalked past with audible comment, and business men made hurried trips to the scene and took their places in the line." Hickman also said in his confession that his decision to kidnap Marion Parker was not an act of revenge against her father, but simply because he had worked at the same bank as her father, and he had seen her coming in to visit him. Hickman said that he needed the money to go to college. He wanted to attend Park College in Parkville, Mo., a religious institution near Kansas City. After college, he said, he planned to "go straight from then on." Hickman said he brought Marion to his apartment and strangled her with a towel because, he said, "I was afraid she would make a noise." He placed her body in the bathtub, cut off her arms and legs, sliced her open at the waist, and then put her body on a shelf, with a towel beneath it to soak up the blood. "I knew that if I refused to take her back Saturday morning she might distrust me enough to give some sign which would cause my discovery," Hickman wrote in his confession. "Yet I felt that if I did take her back in day light I might fall in a trap and be caught. So in order to go through with my plans enough to get the money and to keep Marion from ever knowing while she lived that I would disappoint her confidence in me, I killed her so suddenly and unexpectedly, as she passed beyond consciousness so quickly and unexpectedly that she never had a fear or thought of her own death. Then in order to get her out of my apartment without notice I was prompted after she was beyond consciousness to dissect her body." Hickman said he then realized that he would have to prove that Marion was still alive to receive the ransom money. So he combed her hair, put powder on her face, used a needle and thread to hold her eyelids open, then carried her body out in a suitcase to meet with Parker. 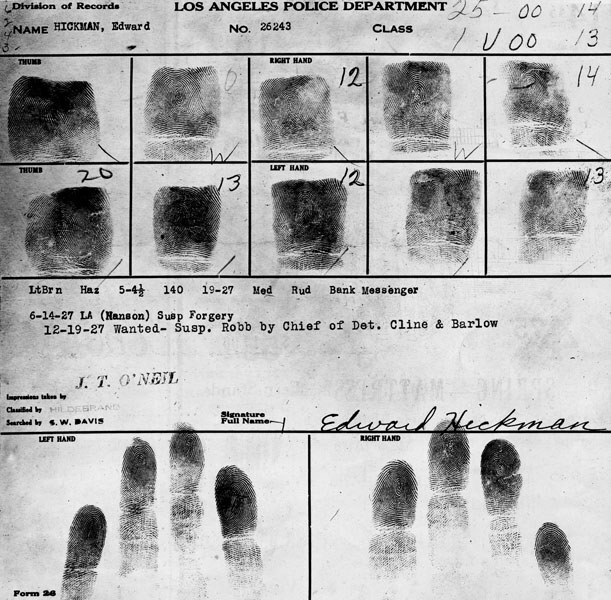 In addition to the murder of Marion Parker, Hickman also confessed to a series of drug store robberies in Los Angeles, including one in December 1926 in which the store proprietor, 24-year-old Clarence Ivy Toms, was shot to death, and a police officer was shot in the hand. Hickman's life of crime began in his hometown of Kansas City, Mo., and he started stealing candy when he was 11 years old. 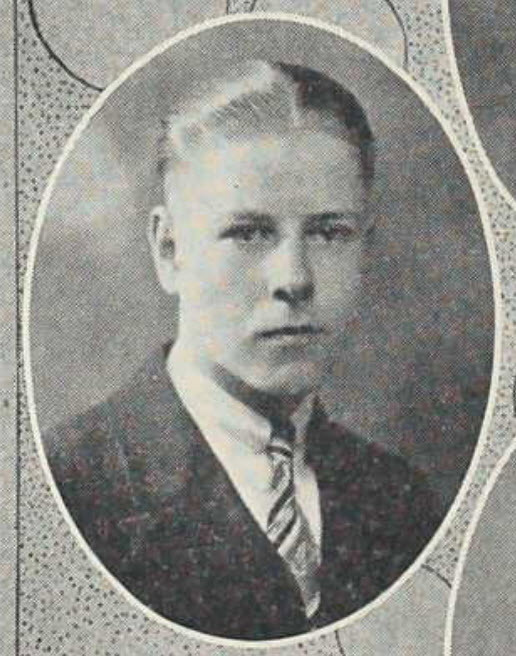 After moving to Southern California, Hickman's crimes escalated, with the help and support of his friend, Welby L. Hunt, a high school honor student Hickman met when he lived in Missouri. On Christmas Eve 1926, Hickman and Hunt, both armed with pistols, walked into the Rose Hill Pharmacy at 4543 Huntington Drive in Los Angeles, and announced the hold-up to Toms and his wife, Ruth, who followed the bandits' orders and put their hands in the air. While the robbery was in progress, Officer J.W. Oliver walked into the store, and Hickman and Hunt opened fire. Toms, who had graduated in 1924 from the University of Southern California's College of Pharmacy, was hit in the chest, and Oliver was hit in the right hand. Oliver returned fire, but didn't hit either of the bandits, who escaped. 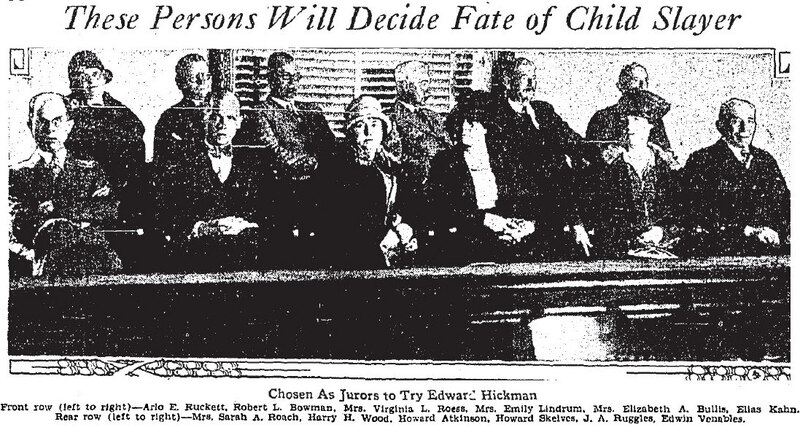 At Hickman's trial for the Marion Parker murder, hundreds of reporters and spectators attempted to get into the courtroom -- "Tarzan" author Edgar Rice Burroughs covered the trial for the Los Angeles Examiner -- and hundreds more gathered outside, demanding justice and Hickman's blood. Hickman attempted to plead not guilty by reason of insanity -- one of the first such efforts in the state of California -- but, after 13 days of testimony, that defense was rejected by the jury after only 36 minutes of deliberations. One of the key pieces of evidence against the insanity defense was a letter written by Hickman to a fellow prisoner, asking for his advice on how to secure an insanity verdict. "I've got to throw a fit in court," Hickman wrote, "and I intend to throw a laughing, screaming, diving act before the prosecution finishes their case -- maybe in front of old man Parker himself." Hickman was found guilty and sentenced to death. "The state wins by a neck," Hickman said after the jury's verdict was read. "I don't think I have much to live for, and I don't know yet why I killed the Parker girl, but I did it, and I'll take my punishment." In a separate trial, Hickman was also found guilty in the Toms murder, and was sentenced to life in prison. Hunt was also sentenced to life for the Toms murder, but was later paroled. 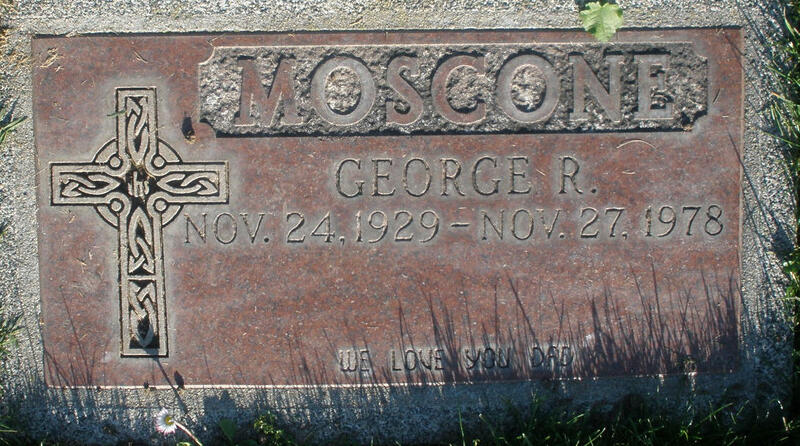 He died on May 26, 1995, at the age of 84, and is buried in Cathedral City, Calif.
Hickman spent his final days on Death Row in San Quentin writing letters of apology to the people he had wronged, reading the Bible and listening to jazz records on his phonograph. 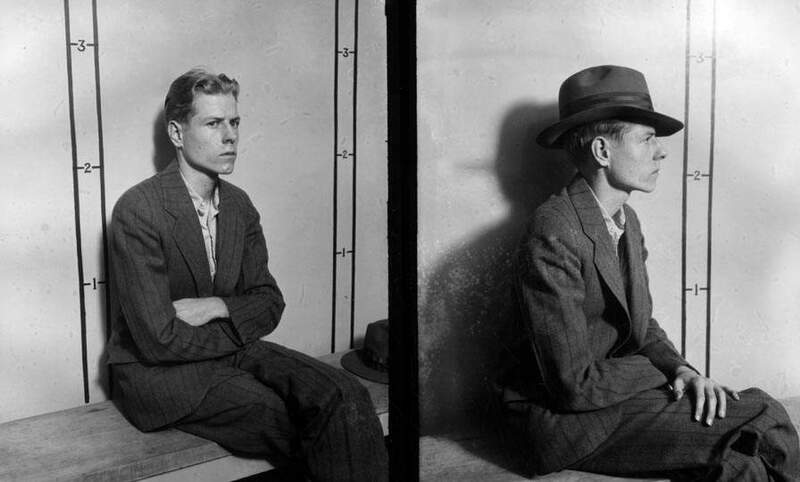 Hickman's partner in crime, Welby Hunt, was also sent to San Quentin, for a life sentence, at the age of 17. Hunt was eventually paroled, and died in 1995, at the age of 84. Although Hickman told prison guards and his cellmate that he would walk confidently to the gallows, strengthened by his new-found religious beliefs -- he converted to Catholicism while in prison -- he only got about half way up the 13 steps before he slumped, and guards had to prop him up to assist him to the top. As he reached the trap door, he looked toward the ceiling and began reciting a quiet prayer, witnesses said. When the black hood was placed over his head, he started to collapse again, and the executioner quickly signaled for the rope to be cut, releasing the trap door at 10:10 a.m. Since Hickman was already slumping forward when the trap door opened, witnesses said the drop didn't have the desired effect of snapping his neck and causing an immediate death. Instead, his head hit the side of the gallows, and he dangled at the end of the rope, violently twitching and jerking. The prison doctor climbed a step ladder next to Hickman and put a stethoscope to his chest. Fifteen minutes after the trap door opened, the doctor stepped away and nodded, signifying that Hickman was dead -- not a quick death from a broken neck, but a slow strangulation. 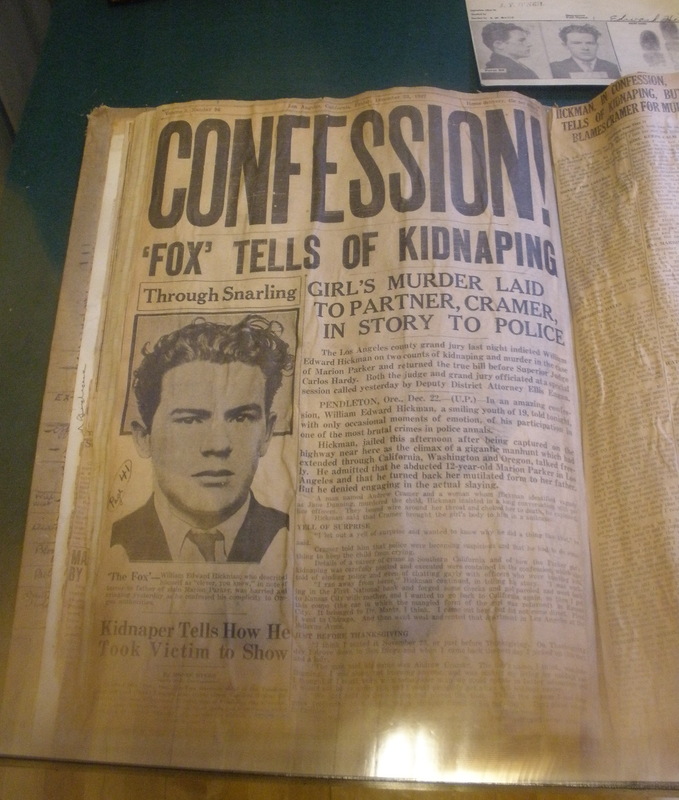 Pages from Hickman's confession are on display at the Los Angeles Police Historical Society museum, along with a thick album of clippings from the newspaper coverage of the case. The school from which Marion was kidnapped, the Mount Vernon Junior High School, has been completely rebuilt, and was renamed the Johnnie L. Cochran Jr. Middle School in 2006. 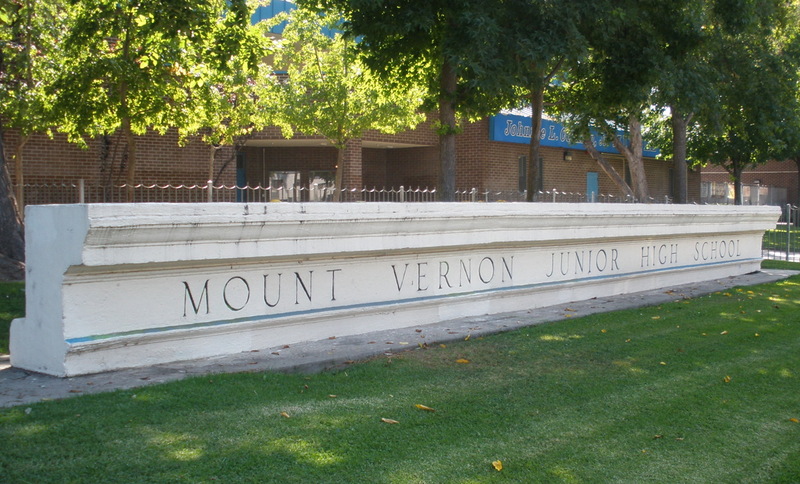 Although the original school building is gone, a large stone piece from the original building, carved with the name "Mount Vernon Junior High School", was saved, and is currently located on the grounds of the school, next to the main entrance. 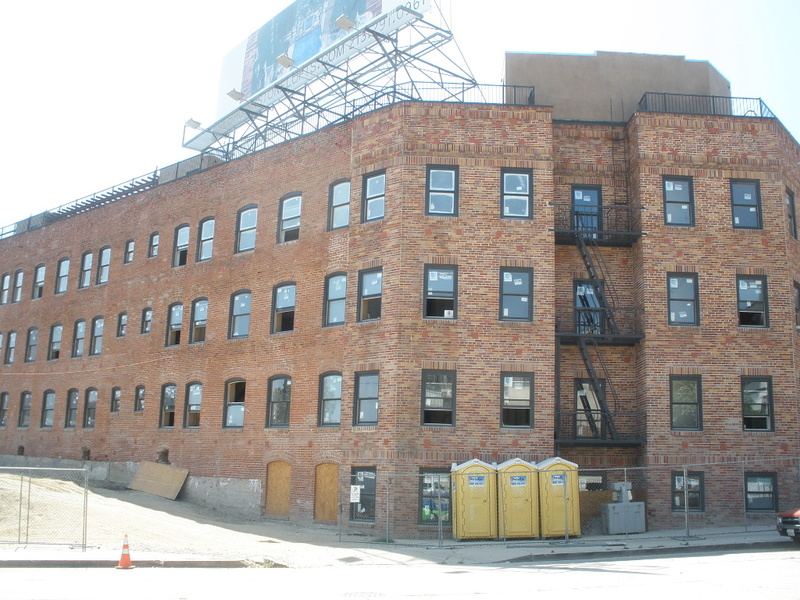 The Bellevue Arms apartment building, where Marion was killed, was being remodeled in 2009 into condominiums, to be known as The Brownstone Lofts, with prices starting at $1 million. 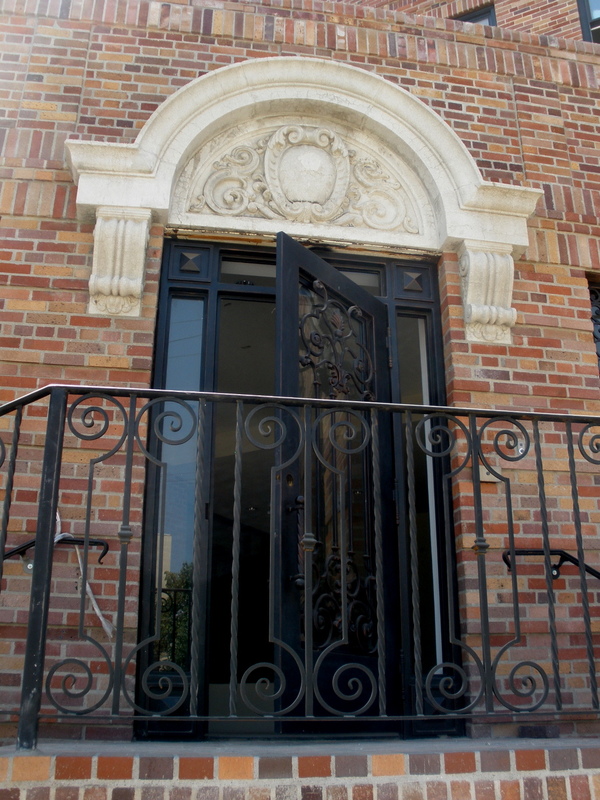 The original exterior and interior brickwork were to remain, including the original archway over the front door, where Marion likely entered. The condominiums would have correspond roughly, but not exactly, to the layout of the original apartments, and there would have been a Unit 315. 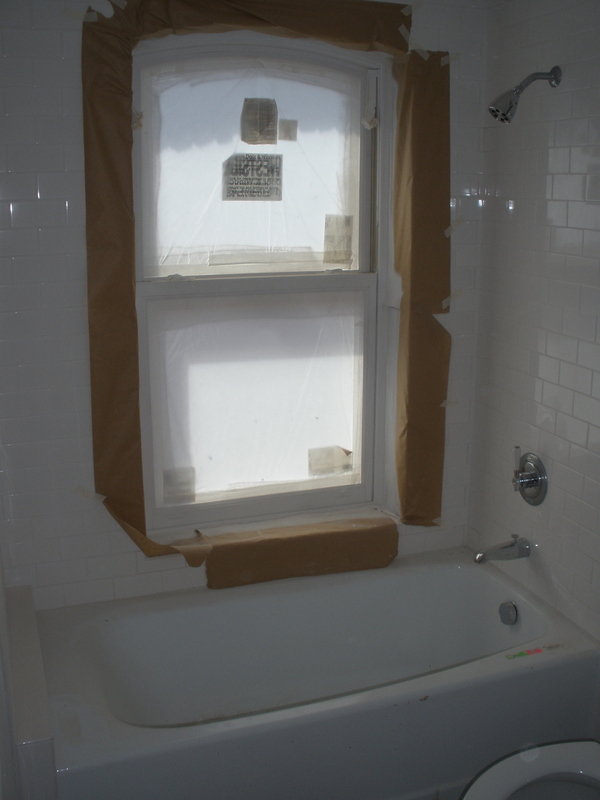 And, yes, Unit 315 would have had a bathtub. 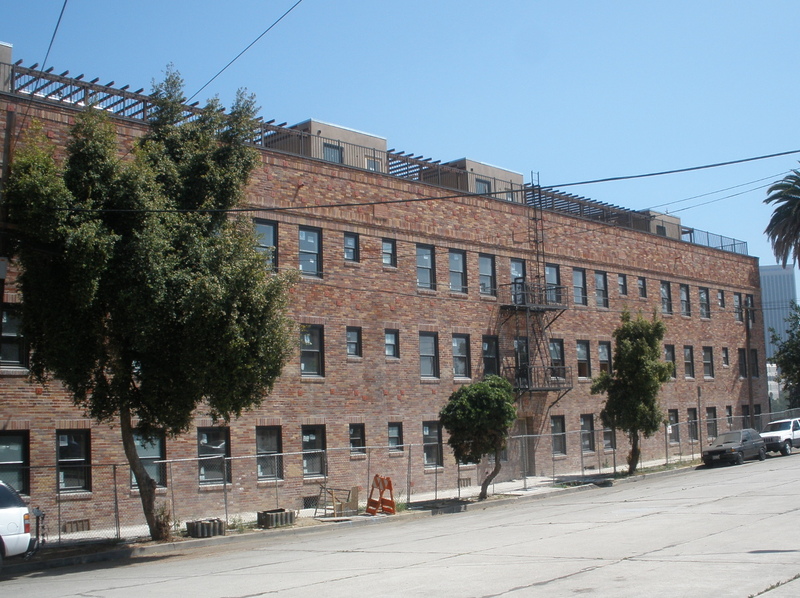 In 2012, however, the project developer filed for bankruptcy, and the building was sold to a new owner, who plans to complete the renovation and rent out the 55 units in the building, which will be known as Bellevue Lofts L.A., as apartments. Marion's mother, brother and twin sister moved out of the family home on South Wilton Place in 1948. Marion's mother, Geraldine Heisel Parker, died in San Diego, Calif., in 1963, at the age of 75. 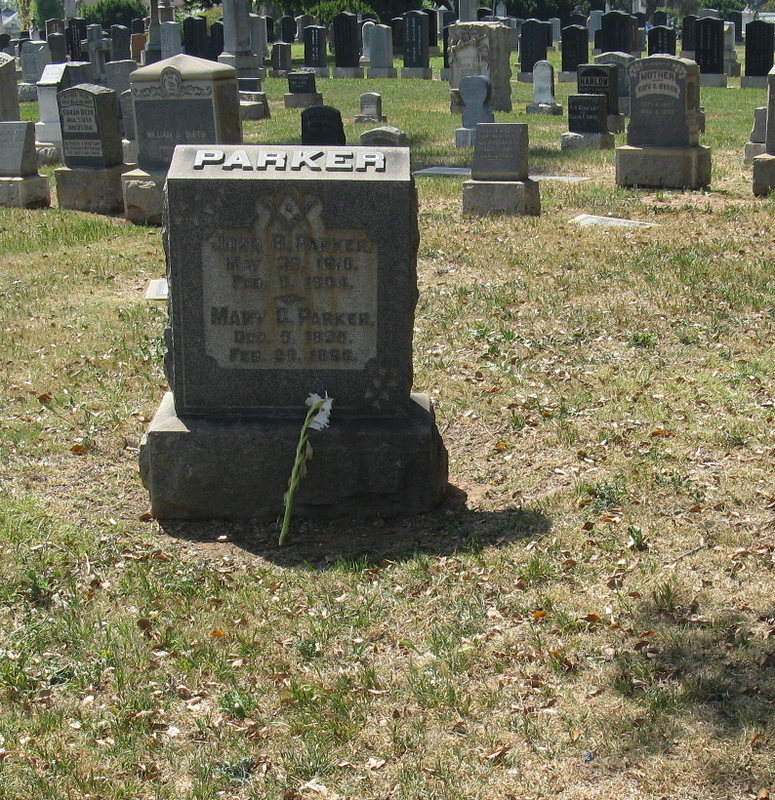 Geraldine Parker is also buried in the Parker family plot at Evergreen, but her grave is unmarked. 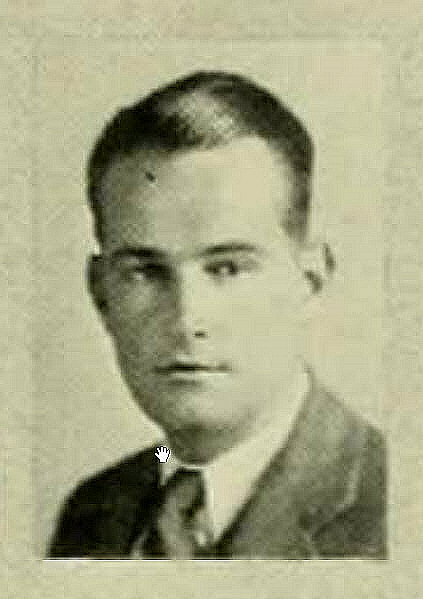 Marion's brother, Perry Willard Parker, died in Torrence, Calif., in 1983, at the age of 75. (Her brother enlisted and served two tours of duty with the Air Force -- during World War II, from 1942 to 1946, and during the Korean War, from 1951 to 1952.) Marion's twin sister, Marjorie H. Parker, married, moved to San Diego, and died in 1987, at the age of 71. 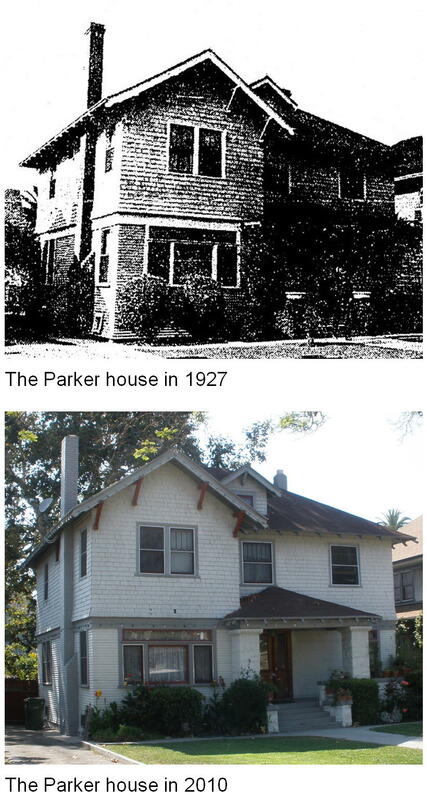 In 1990, the Los Angeles Times published an article about allegedly haunted locations in the area, including the Parkers' former home at 1631 S. Wilton Place. In the article, it was reported that Michelle Pelland and Steve Daley purchased and then sold the house in 1988, and said they believed that the ghost of Marion Parker lived with them. They reported hearing footsteps on the stairs and finding objects displaced at times, as well as lights going on and off for no known reason. Pelland and Daley said they felt they were sharing space with a benevolent, childlike and non-threatening spirit. Special and sincere thanks to my great graving girlfriend, Jayne Osborne, for her kind and generous assistance in gathering the photos and research for this story. I couldn't have done this without you.